EAFRD support from multiple measures is used to promote the cooperation of dairy farms in joint actions aiming at the protection and enhancement of the biodiversity in the Eifel region in Western Germany. In the Eifel region, grassland is used mainly by intensive dairy farms producing 8000-11000 kg milk/cow/year. Intensive farming has led to intensification of grassland and, management practices which have endangered meadows, biodiversity, mountain pastures. For 30 years informal communication networks have been developed via the personal commitment of Prof. Schumacher (University of Bonn) and his ability to communicate with farmers, conservationists and administrations. EAFRD measures give the opportunity to make good use of these networks to safeguard biodiversity. The main objectives of the projects are to: i) enhance biodiversity in the Eifel region by establishing two agri-environmental schemes using measures 214, 216 and 323 of the Rural Development Programme; ii) promote the co-participation of conventional and organic dairy farming and public land resources in a grassland conservation programme in partnership with the University of Bonn. 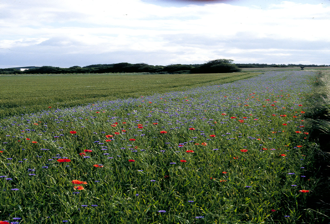 The schemes involve implementing farming practices that allow biodiversity to thrive, e.g. : integrating hay into cows’ diets; implementing a monitoring system and; research on nature conservation, farming practices and regional development. Public property is also included in the scheme, e.g. by leasing it to farms under conservation contracting. The project brings together the wide range of stakeholders in meetings to inform, animate and plan the scheme implementation and monitoring details. More than 5000 hectares of grassland is under nature conservation contracts including 25% of the intensive dairy farms in the area. Loss of plant biodiversity has been halted. Many endangered “red-list” species now have stable and growing populations. Participating farmers successfully implement “conservation by use”, and even the most productive farms are taking part. On-farm experiments by farmers with fodder from the grasslands reveal new ideas for stabilising milk yields. To be successful, measures must be promoted and implemented by committed, enthusiastic partners including local opinion formers. The participation of a critical mass of farms is needed to achieve visible results and wider regional acceptance. EAFRD funding, nature conservation contracting and agri-environment schemes should be accompanied by flexible instruments, e.g. investment support by foundations, public land for use by farmers and scientific support.